Twelve months of planning, six months of knowing my team mate, and a five month expedition ahead of us. Anna, my kayaking partner, and I had both stared up at the large cheering crowd on Westminster Bridge where friends and family had come to wave us off before we were swept along with the fast flowing current of the Thames. Passing the Houses of Parliament, London Eye and Tower Bridge, our first 25km of our 4000km world first expedition was a spectacular and special moment that will stay with us forever. 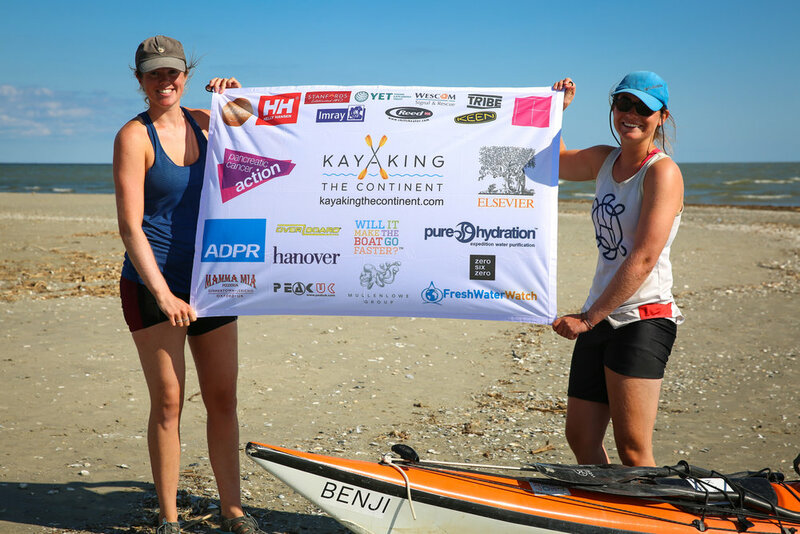 Endless months of us pouring over maps and trying to get sponsorship and grants, such as the generous contribution given by Youth Explorers Trust – it was all worth it to get to the start line on 21st April. London to the Black Sea by tandem kayak was an idea that most people dismissed as my mad dream. But now we had the opportunity to begin the physical and mental challenge, while also raising over £50,000 for Pancreatic Cancer Action and collecting water samples for Freshwater Watch. The first eight days saw us make it down the Thames and round the Kent coast to St Margaret’s Bay. While the beginning of the week was made easier by nice weather and hospitable Sailing Clubs allowing us to stay in the warmth, the last four days were tricky. The wind picked up and often forced us to pull into shore to set up our tents for the night. On one occasion, after battling strong headwinds all day, we had no choice but to go to shore and continue a 2km trek with our 80kg kayak and equipment through sinking sand to get to the bank that wouldn’t be effected by the tide coming in. It was exhausting, but we always found comfort in knowing we had pasta and chocolate to look forward to in our tents. On our last day to St Margret’s, we got caught in fog coming down on the white cliffs, but luckily managed to crash land in the bay before being told gale force winds were due for the next seven days so our Channel crossing was to be postponed. Fortunately, the weather for the Channel was perfect and we had no trouble in the 5 hours it took us to cross. Once in Calais, we had around two months paddling through the French and Belgium canals and small rivers, with over 100 locks to navigate until we reached Strasbourg. While some later sections were beautiful, a lot of it was monotonous and industrial and we were looking forward to the flow of the big rivers. We narrowly avoided being run over by large barges, had equipment breaks that took weeks to replace, and we both struggled with illness from the water, alongside long nights through intense storms. Yet, we were loving it. We were living the dream of making our way through the waterways of Europe and met the most wonderful people who took us in for drinks, cake, dinners and showers. We were well looked after by many a stranger we met along the way and this was only to be a theme for the rest of the trip. From Strasbourg, we took the Rhine down to Mainz. While our first two days were almost a disappointment due to the lack of flow, we soon learnt to be careful what we wished for. Once passed our second lock of the Rhine, the flow became so strong, that our first attempt at trying to stop by holding on to a rock resulted in us pivoting round and facing an oncoming industrial barge. Whirlpools and rapids had emerged and we were going 15km/h barely paddling, with little control of steering as traffic came from both directions. We were so taken aback by the sudden change that we took refuge in a yacht club for a few days. Once our spirits were back up, we carried on our attempt down to Mainz and soon found a love for the Rhine. Magical beaches to camp on with beautiful vineyards lining the banks, and the stream had dropped to just the right amount of flow so that we were making the distances without having the fear of running into barges. The Main River and Main-Donau Canal in Germany were back to the calm small river days and pretty small towns. Yet, we missed covering the distance and the excitement of the Rhine. Fortunately, we had the Danube to look forward to… or so we thought. A hot summer and lack of rainfall meant the river was abnormally low and the stream was that of a canal. We weren’t able to do the distances we had planned and needed to do. It was incredibly frustrating, but we both agreed we just needed to switch up our routine and for the following months our alarms were set to 5am to ensure we were able to paddle 10-12 hours a day. It didn’t take long for us to find the mornings our favourite time of the day. Morning sun was often breaking through the mist, and we could smell fires on the banks being started up again by fellow campers. After the initial disappointment of the Danube, it soon redeemed itself. We had stunning wild camping spots with spectacular sunrise and sunsets through Germany, Austria, Slovakia, Hungary, Croatia, Serbia, Bulgaria and Romania. Of course, like anything on this trip, we had low points and high points; our kayak was badly damaged and started to sink, language barriers at border crossings caused difficulties, interesting encounters with wildlife and we had yet more headwinds. But it didn’t matter. There was always a solution and the two of us worked incredibly well as a team to sort out any difficulties with some giggle fits in-between. Alongside that, we were blown over by the generosity of strangers who always helped us in times of need. From the Austrian men who fixed up Benji the kayak, to the Serbian men who spoke no English but cooked us lunch and gave us clothes to warm us up on a windy morning where we had to call it a day. We really did find refuge in the most unlikely of places. Despite our best efforts to keep our pace up with our original plan, we were running one and a half months late on our original schedule due to illness, equipment setbacks and weather. I had to fly back on 20th September as I had to start my first term of university, so we had a firm deadline. Therefore, we sadly had no other choice but to take a car for half a day as the weather became so bad that our 70km avg per day was often down to 7km and likely to end with us being washed up on some bank in rural Romania. But we put our kayak back in the water at the Danube Delta for the last two days of paddling. And on September 18th, we paddled out into the wide expanse of the Black Sea with a mix of emotions. Five months later, we had made it. Maybe not in the way we had wanted to, but the challenge had been so huge it made no difference to us. We had made the journey. While I can write about the physical aspect of the trip, what is harder to explain is the immense sense of friendship and teamwork Anna and I both had during that journey. We had started as strangers meeting on an adventure website to becoming practically sisters, and the expedition was only more memorable because of that. We were undoubtedly lucky that we never argued and were in constant giggle fits through the tough and the good times. So to complete the expedition on that day was extremely sad, but I was thrilled that it surpassed any expectations I had imagined on that day in London where it all began. While this was a huge challenge in itself, we are pleased to say we also raised over £57,000 for Pancreatic Cancer Action and took over 80 water samples to be analysed by FreshWater Watch to look at the effects of urbanisation on freshwater.